All you keen readers of Interior Design magazines may have spotted us in August's issue of "Ideal Home". 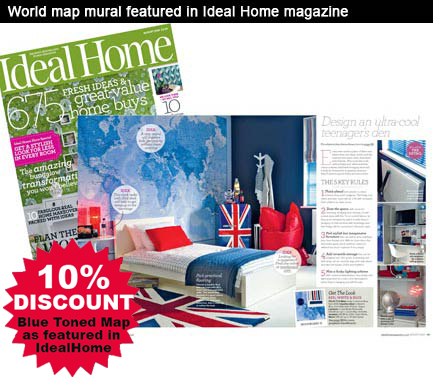 We printed a World Map, converted to blue tones for a room set featured at this years Ideal Home show, and the photos were shown in this month's magazine. The magazine recommended the map wall covering as an ideal mural in a teenage boys bedroom - we agree - although the world map works as a stunning and educational feature in all rooms; at home or work. Our range of wallpaper finishes provides a print solution for any application. This mural was printed onto our Classic paper - ideal for bedrooms, living rooms, offices etc. We can also offer a laminated wallpaper suitable for kitchens, bathrooms, restaurants etc. Why not have a map printed onto our Doodle Wall so you can write on it with a dry wipe marker, or buy our magnet receptive liner to fit under the wallpaper so you can stick magnets to the map. Customers that have seen this article so far this month and ordered the blue toned world map wallpaper include a school, a university, and lots of mums of teenage boys! Extra blue edges can be added to accommodate a more specific size. Please note a further charge would be applicable. 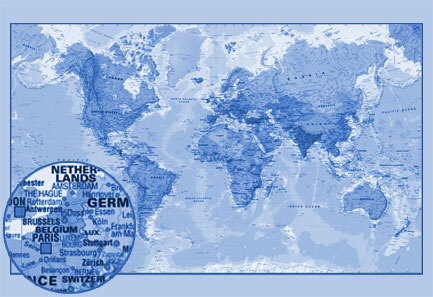 Quote "WORLDWALL30" at checkout to receive 10% off set sized world map murals.